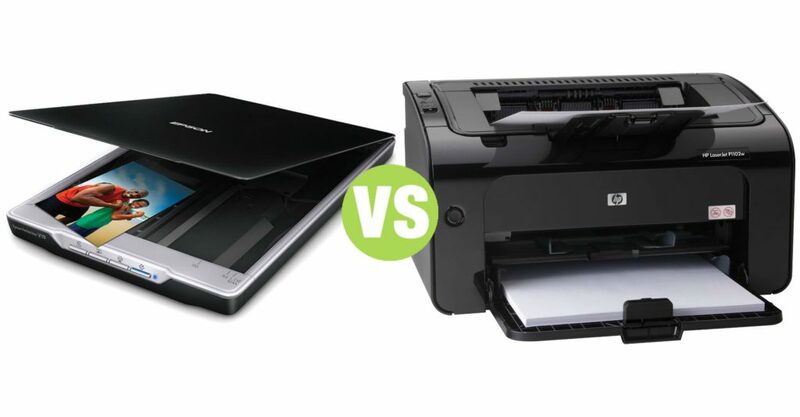 Summary: Difference Between Scanner and Printer is that Scanner, also known as optical scanner, is a light-sensing input device that reads printed text and graphics and then translates the results into a form the computer can process. While printer is an output device that produces text and graphics on a physical medium such as paper. Many different types and styles of printers exist with varying speeds, capabilities, and printing methods. Some input devices save users time by capturing data directly from a source document, which is the original form of the data. Examples of source documents include time cards, order forms, invoices, paychecks, advertisements, brochures, photos, inventory tags, or any other document that contains data to be processed. Devices that can capture data directly from a source document include optical scanners, optical readers, bar code readers, RFID readers, magnetic stripe card readers, and magnetic-ink character recognition readers. Scanner, also known as optical scanner, is a light-sensing input device that reads printed text and graphics and then translates the results into a form the computer can process. A flatbed scanner works in a manner similar to a copy machine except it creates a file of the document in memory instead of a paper copy. Once you scan a picture or document, you can display the scanned object on the screen, modify its appearance, store it on a storage medium, print it, fax it, attach it to an e-mail message, include it in another document, or post it on a Web site or photo community for everyone to see. Many scanners include OCR (optical character recognition) software, which can read and convert text documents into electronic files. OCR software converts a scanned image into a text file that can be edited, for example, with a word processing program. A printer is an output device that produces text and graphics on a physical medium such as paper. Many different types and styles of printers exist with varying speeds, capabilities, and printing methods. Although many users today print by connecting a computer to a printer with a cable, a variety of printing options are available now. Today, wireless printing technology makes the task of printing from a notebook computer, smart phone, or digital camera much easier. Two wireless technologies for printing are Bluetooth and infrared. With Bluetooth printing, a computer or other device transmits output to a printer via radio waves. With infrared printing, a printer communicates with a computer or other device using infrared light waves. Instead of downloading photos from a digital camera to a computer, users can print these digital photos using a variety of techniques. Some cameras connect directly to a printer via a cable. Others store photos on memory cards that can be removed and inserted in the printer. Some printers have a docking station, into which the user inserts the camera to print photos stored in the camera. Finally, many home and business users print to a central printer on a network. Their computer may communicate with the network printer via cables or wirelessly. An impact printer forms characters and graphics on a piece of paper by striking a mechanism against an inked ribbon that physically contacts the paper. Impact printers are ideal for printing multipart forms because they easily print through many layers of paper. Two commonly used types of impact printers are dot-matrix printers and line printers.